Baby, it's cold outside in much of the USA this month! Let's talk about Alopecia Style™ with some new twists. 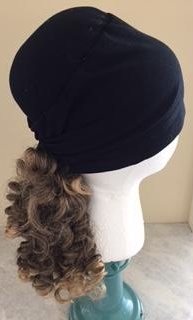 Not only are we getting fun and versatile for our friends in the deep freeze, we can adapt these ideas for layering hats and "hair" in all climates. Bald Girls Do Lunch and Alopecia Style™ encourage choice in everything you wear and when you choose to wear them. In this frigid February, warmth really matters, but so does feeling cheerful when the skies are gray. 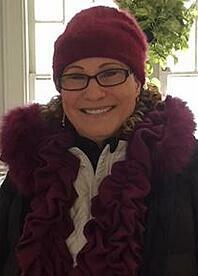 Here's my thinking for perking up a black coat, staying warm, comfy and adding color to combat gray skies. The steps and parts are deconstructed below. Creative spark: The first wave hit when sorting through a back-of-the-closet bin of accessories. 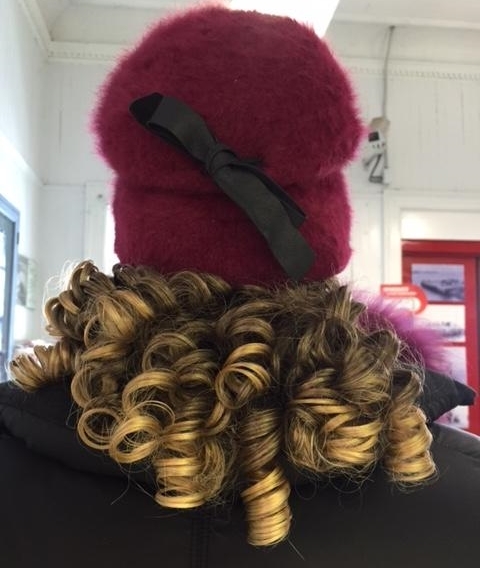 I spied synthetic curls attached to a strong butterfly claw-clip. Curls! That will be a change of pace. Texture: Wavy, feminine and soft scarf to contrast with solid puffer-coats. 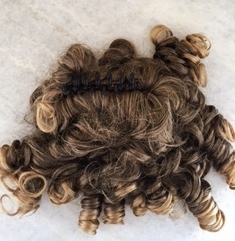 I've never ever worn curly hair, so this was totally fun to have these curls dancing around. Do you have layering ideas and creative combinations? Share with us in the comments below!